Synopsis: Cam Brady (Ferrell) is a Congressman from the 14th District of North Carolina who has won four straight elections unopposed. But after a disastrous wrong number call to his mistress goes public, the Motch Brothers (Dan Akroyd and John Lithgow) – his biggest donors – decide to replace him by funding a new candidate, the goofy but harmless Marty Huggins (Galifianakas). Andrew: Hello readers! 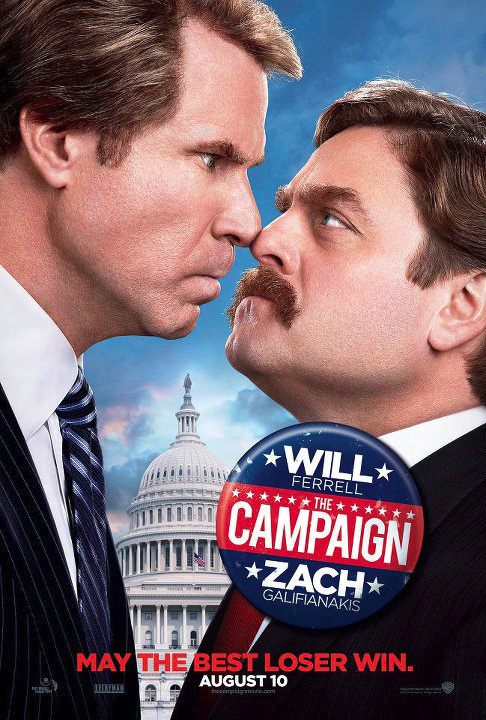 Earlier tonight Sarah and I caught the new R-rated comedy The Campaign. 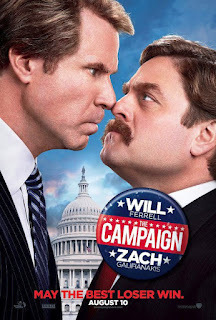 Directed by Jay Roach (of the Austin Powers trilogy fame), it stars Will Ferrell (Anchorman: The Legend of Ron Burgandy) and Zach Galifianakas (The Hangover) as two rival candidates campaigning for the Representative Seat for the 14th District of North Carolina. This is one of the movies we previewed this week. I think it’s safe to say it’s one we’ve been looking forward to. It has a great pedigree with the director behind it as well as all the talent involved. But right off the bat I think something that needs to be said is that The Campaign is the crudest and most vulgar movie I’ve seen that Roach has directed. It’s a hard R as far as the language goes. Sarah: It’s very much in keeping with a Will Ferrell movie. You know, he brought a lot of raunchiness to the film, not only as his character, but every now and then he’s known for comedic roles where he’s be vulgar. S: Ok, yeah there’s a lot of dirty language in that respect. A: I honestly can’t remember the last film I’ve seen Ferrell talk this dirty. 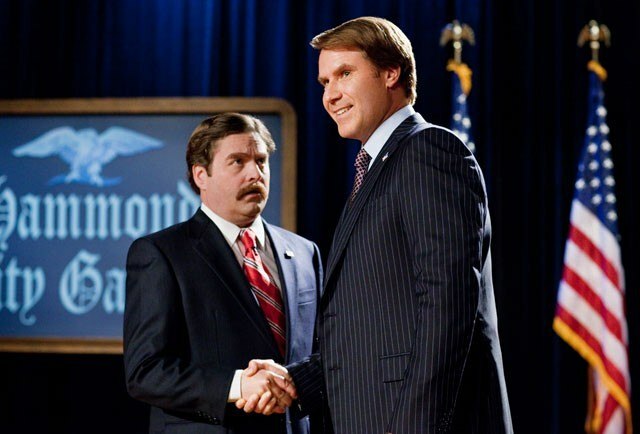 The Campaign is definitely the most vulgar movie we've seen Will Ferrell in. This look Zach Galifianakas' Marty Huggins is giving Ferrell's Cam Brady is because of a particularly dirty line. S: I don’t know, we’d have to go back and look. Maybe Wedding Crashers or Old School. But there’s not a whole lot of sexual vulgarity. There’s SOME, particularly early on, but nothing too explicit. I think it’s safe to say, though, that it was very funny. And I really, really enjoyed the chemistry between Ferrell and Galifianakas. It was refreshingly different from his chemistry with John C. Reilly. It was a smart film, it was witty and very much a poke at the whole political scene. So I found it funny – not roll on the floor, laugh-a-minute, but funny nonetheless. A: It’s not laugh-a-minute but a lot of it is maybe laugh-every-other-minute because they throw so many jokes out there. There’s a lot of shtick in The Campaign. There’s a lot of Ferrell’s usual shtick and Galifianakas’ shtick and sometimes it’s a little much. In particular, one scene where Ferrell’s Cam Brady has gone pretty bonkers and is raging around the office. But other than that, I think they balance a fine line between the actors’ strengths as well as having a great supporting cast. Dan Akroyd (Ghostbusters) and John Lithgow (3rd Rock From the Sun) fair well though are underused. Dylan McDermott (American Horror Story) and Jason Sudeikis (Horrible Bosses) are funny in their supporting roles as campaign managers. And then you have Brian Cox (Super Troopers) as Marty’s dad and his maid, Mrs. Yao (played by Karen Maruyama) who is probably the funniest recurring gag in the movie. S: Yeah I think she’s my favorite character in the whole movie. Althought Galifianakas…when he does his different voices I find him quite humorous. I just want to hug him. He’s so funny and I really enjoyed him. A: A lot of my favorite scenes had to do with scenes where I couldn’t tell if it was scripted or improvised, but the dinner scene with Marty’s family where he tells his family it’s okay to tell him their secrets. It had me going pretty good. Then I don’t know why, but I loved the on-going joke about Marty’s pugs and Cam’s reaction to them. I honestly think I squeaked at one time because I was trying to hold in my laughter since I seemed to be the only one laughing. I found the whole film pretty funny. Again, it’s VERY vulgar so do NOT take kids to this. It is NOT a kids movie. S: No it’s not. Tons of bad language, but clever. I found it very clever. 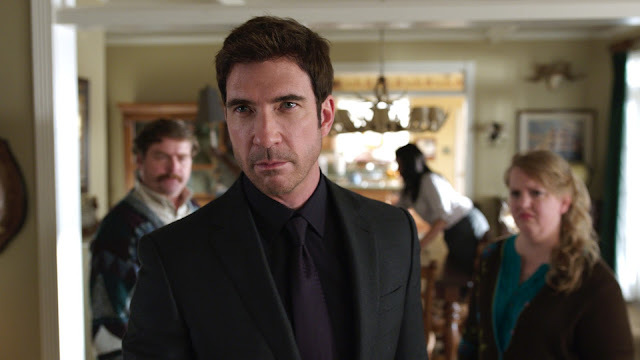 We didn't mention it elsewhere in the review, but our favorite joke is actually one about Dylan McDermott here and another actor whose name we get confused with a lot. A: It was a nice satire on the whole idea of how politics work and the tactics people use and what might actually be going on with donors like Akroyd and Lithgow’s Motch Brothers being the puppeteers to Cam and Marty’s puppets. S: Good point! And I wanted to mention how outrageous some of the humor is, too! Like when Cam accidentally punches a baby and then later hits another thing that’s possibly even funnier. At least it was to us. Overall I think my expectations weren’t exactly met. I think they may have been a little too high. But I think this is one of those movies, like a lot of Ferrell’s and these kinds of comedies where you need to watch it more than once. There’s a ton of one-liners that can be taken from here and probably will. A: Agreed. I will say that, like I said in our preview, my expectations were a little lower because of The Watch and how it was also a R-rated comedy with a good pedigree behind it and it was bad. The Campaign is better than The Watch, hands down. So it exceeded my expectations. But I will say one other negative thing – there were times, and this is because Ferrell went to his usual pool, that he sounded exactly like Ricky Bobby. He plays a Southern character again, had the same inflection again though maybe with a hint of his George W. Bush impression from Saturday Night Live, but it’s not a bad thing. It just kinda took me out of it for a second. Overall, I thoroughly enjoyed it, and personally I think it’s one we’re going to own some day. S: Probably! I also thoroughly enjoyed it! You don’t necessarily need to see it in theatres but it’s definitely a great way to kill a Saturday afternoon or a fun evening at the movies in general! FINAL VERDICT: It will join our movie collection some day! Have you gotten around to seeing The Campaign? We don't see it in your archives.